Tactical Boots That are Comfortable? Thanks, Blauer! Wondering where you can find tactical boots that are actually comfortable? Well, look no longer. Blauer is proud to announce that the new 4” STRIKE shoe is now in stock and available through participating authorized distributors and online at blauer.com. The shoe builds upon Blauer’s successful line of footwear for law enforcement, fire, and emergency medical services professionals, heeding their call for a lower-ankle option for everyday use. 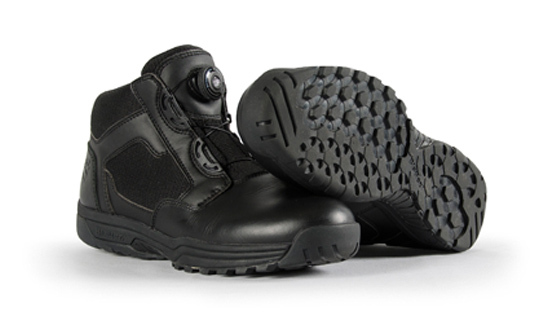 More than simply another option in the tactical shoes marketplace, the STRIKE has been carefully engineered to take the best features of tactical boots and distill them down into a high-comfort option for those looking for EMS shoes, station footwear, or everyday use in law enforcement outside of their full-height police boots. Blauer’s use of the patented BOA® lacing system ensures a custom fit every day, throughout the day, no matter what work entails. Breathable upper material is utilized in key locations to reduce overheating, and a flexible but durable sole allows the wearer full range of motion while still ensuring stability and grip in a variety of conditions. The STRIKE shoe is available in Regular and Wide widths in sizes ranging from Men’s 7 to Men’s 15, and in Regular width Women’s sizes from Size 5 to Size 10.